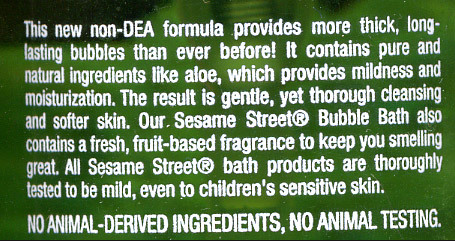 My wife bought me a bottle of Sesame Street© bubble bath. Here’s the back of the bottle. Now I can’t stop wondering what Drug Enforcement Administration version of bubble bath would be like. The non-DEA bottle has Cookie Monster on it, the DEA one would probably have Bert. If it’s not that DEA, which DEA is it? Dance Educators of America? Data Encryption Algorithm? Department of Elder Affairs? Oh, wait, wait. False alarm. It’s not an unsolvable mystery. DEA stands for Diethanolamine. But come on, this is not the DEA we all know and love.